In the last few months, we have started conducting data science hackathons. These hackathons are contests with a well defined data problem, which has be be solved in short time frame. They typically last any where between 2 – 7 days. If month long competitions on Kaggle are like marathons, then these hackathons are shorter format of the game – 100 mts Sprint. They are high energy events where data scientists bring in lot of energy, the leaderboard changes almost every hour and speed to solve data science problem matters lot more than Kaggle competitions. One of the best tip, I can provide to data scientists participating in these hackathons (or even in longer competitions) is to quickly build the first solution and submit. The first few submissions should be real quick. I have created modules on Python and R which can takes in tabular data and the name of target variable and BOOM! I have my first model in less than 10 minutes (Assuming your data has more than 100,000 observations). For smaller data sets, this can be even faster. The reason of submitting this super-fast solution is to create a benchmark for yourself on which you need to improve. I will talk about my methodology in this article. Note: The percentages are based on a sample of 40 competition, I have participated in past (rounded off). 1.Descriptive Analysis : When I started my career into analytics, we used to primarily build models based on Logistic Regression and Decision Trees. Most of the algorithm we used involved greedy algorithms, which can subset the number of features I need to focus on. 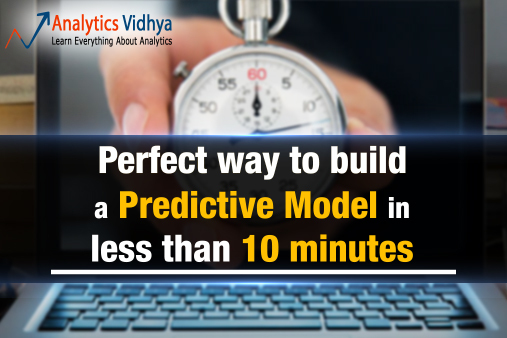 With advanced machine learning tools coming in race, time taken to perform this task can be significantly reduced. For your initial analysis, you probably need not do any kind of feature engineering. Hence, the time you might need to do descriptive analysis is restricted to know missing values and big features which are directly visible. In my methodology, you will need 2 minutes to complete this step (I assume a data with 100,000 observations). Create dummy flags for missing value(s): In general, I have discovered that missing values in variable also sometimes carry a good amount of information. For instance, if you are analyzing the clickstream data, you probably won’t have a lot of values in specific variables corresponding to mobile usage. Impute missing value with mean/any other easiest method : I have found ‘mean’ works just fine for the first iteration. Just in cases where there is an obvious trend coming from Descriptive analysis, you probably need a more intelligent method. 4. Estimation of Performance : I find k-fold with k=7 highly effective to take my initial bet. This finally takes 1-2 minutes to execute and document. The reason to build this model is not to win the competition, but to establish a benchmark for our self. Let me take a deeper dive into my algorithm. I have also included a few snippets of my code in this article. "ID" "Gender" "City"  "Monthly_Income" "Disbursed" "train"
Hopefully, this article would have given enough motivation to make your own 10-min scoring code. Most of the masters on Kaggle and the best scientists on our hackathons have these codes ready and fire their first submission before making a detailed analysis. Once they have some estimate of benchmark, they start improvising further. Share your complete codes in the comment box below. That’s a very well put list 🙂 Thanks Tavish. This is a fantastic way to kick-off the model building. You are right that we should have such model handy while doing model building. If from the very beginning we start thinking about optimization of the model then this will take lots of time to develop the model. A step by step approach always helps to break the problem and get a reliable and quick outcome. I visit Analytics Vidhya almost daily and really like the articles published in the forum. You guys are doing fantastic work. My best wishes with the forum. But here you did not mention who did you treat multicollinearity & non normally distributed data. Given that we are using tree based algo, you need not worry about multi collinearity. I am currently working in IT, I am thinking to shift my career into analytics,Is it right decision. I am thinking to start with SAS and R training. What’s your suggestion on this field. Thanks Tavish for sharing this awesomely crafted walk-through, I just wanted to seek your opinion about using Rattle to do modelling as I personally find it very easy and flexible and it doesn’t require me to be a coder. Your thoughts will be highly appreciated. This is a great article and I would really like to step through it using the same data that you use. Can you make the file complete_data.cv available or tell me where I can find it? Thanks a lot for this inspiring article! I am new to data analysis and would like to run your complete code to see the final result. Can you please share it with me, as well as the dataset? Could you please share the data file/atleast edited data file to practice on this. Am the beginner of creating modeling in a company, can anyone please help me with the complete process for creating a modeling for any data. 4. Algorithm used for model preparation. Its very nice article .Thank you . seems we need to do dimensionality reduction process before applying the Model.Could you please explain the Dimensionality reduction techniques( For Variable selection). can u suggest me how to handle missing values in different cases. I also want to lean about data modeling, can you help me on that. Really nice article , I appreciate your efforts . It will be good if you add something more on optimization side. Means after checking the performance what should be the focus area for example add/removing variable to reduce noise/error component and what should be the approach to improve performance.